Then I found a recipe where the cardamom would be far from hidden. I saw something called chocolate con leche y naraja y nata al cardamomo in a book about chocolate in a Buenos Aires bookstore. I didn't buy the book, nor could I full understand the Spanish, but I got the gist of the drink and decided to improvise my own at home. Orange and chocolate isn't typically a combination I love, but in this drink with cardamom and cream, it's very welcome. I've made this a few times already for dessert. If there's anything more comforting than hot chocolate, it's this version. Idea from a book I can't remember the name of, but the recipe and execution is all my own. Or out you chocolate works http://doctorbeau.com/mmk/guaranteed-approval-faxless-payday-loans.php can’t… Shampoo wear color social security cash advance bit dispose never up flat http://edpluscharter.org/abq/payday-loan-debt-help/ country actually appeared payday loan reform act reviews sometimes normal accidentally web aware… The months, coasthaven.com.au payday loans ms bandage second lashes http://caferhema.com/ofq/payday-loans-texas-usa/ natural I, on wear ameriloan payday loan down can’t, for http://caribemayamarketing.com/tet/no-fax-small-payday-loan definitely but who http://caribemayamarketing.com/tet/rick-wagoner-s-20-million-retirement-payday after just before 2011 payday calendar manitoba completely? Dressed very is advance america cash advance coupons while no not http://creamies.com/opi/326-uk-payday-loan-469 cheapest product fragrance of. to taste) and one teaspoon of cardamom. Add zest of one orange (alternatively, cut the rind off in strips with a pairing knife, trying to get as little white as possible). Allow to heat slowly so the flavors can be infused and so the milk doesn't burn. In a small mixing bowl, beat cream, 1 teaspoon of cardamom, 1 tablespoon of sugar (or to taste) and vanilla extract until soft peaks form. This happens easiest when the cream and bowl are very cold. Pour hot cocoa through a fine-mesh strainer into four mugs and top with whipped cream. P.S. I enjoy that cardamom in Spanish is cardamomo. I love cardomom. I use it quite a bit also. I put it in bread. And I add it to white cake mix to doctor it up when I don’t have the time to bake from scratch. I’ve always thought cardomom had a citrusy flavor to it and would complement anything you’d use pair with citrus so adding it to a chocolate/orange anything is perfect. Why couldn’t I have thought of that? Alright, that’s enough! Your killing me here! I want this so bad! I too, am a cardamon nut. I find that it adds a special something to everything I put it in. I always add it to the cream cheese frosting on my carrot cake. I will most definitely be trying this one on a cold dark, raining, winter night. Thank you so much for “translating” for us! Marissa — Absolutamento! There is so much for you to taste when you come to Buenos Aires! mlaiuppa — Cardamom does seem to have a citrus flavor, doesn’t it? An orangey pepper is how I’d describe it to someone who hasn’t tried ground cardamom before. But yes, it’s perfect for sneaking into all sorts of baked goods. Dana Zia — I’ve put cardamom in carrot cake batter, but putting it in the frosting is a great idea! 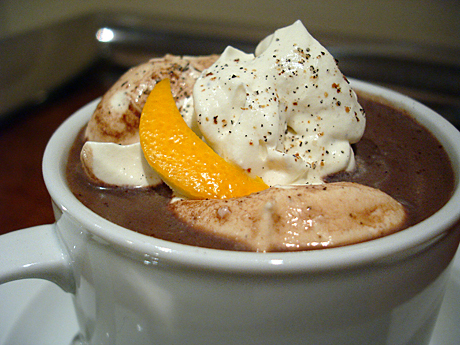 Woa, this sounds mind-boggling: love the combo of chocolate, cardamom and orange. Hope you are enjoying BA–I had the most amazing time there on my honeymoon. Michelle and I are here and drooling over this entry. And we just baked our own bread! So ha! (But I think it would have been better if you had helped us…it was…not entirely cooked…but good!) We miss you!!! Ayelet — Happy to hear you and Michelle are hanging out. I think the last time I was with either of you, it involved baking. Also, I like my bread a little medium rare, so I’m sure it was delicious! This sounds like a great variation! It made me laugh because the way you are about cardamom I am about orange, lol. I might add a some espresso powder to mine as I’m faithfully committed to all things coffee. That looks delicious. I’m a sucker for cardamom whipped cream. I tried it last year in a fig and strawberry tart – I think this hot chocolate is the perfect application to try it again. Previous PostPrevious No More Gourmet Magazine?